« Which Patriots Wide Receiver Is Likely the Odd Man Out? 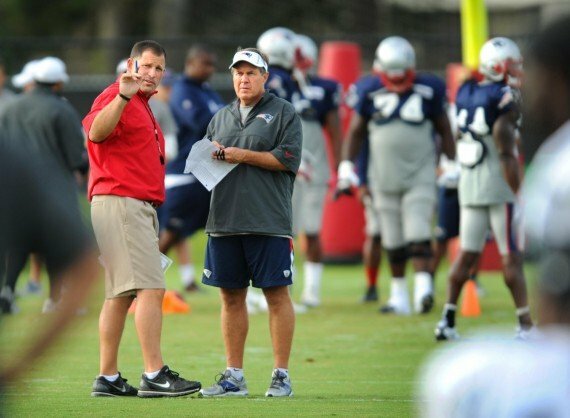 Friday night’s game will be an interesting match-up, as the Patriots and Buccaneers have been practicing together all week—due to the connection between Bill Belichick and former Rutgers and current Buccaneers head coach Greg Schiano. With that being said, here are five things to watch for. 1. Nate Solder’s Progress: Or should I say: Will there be any progress? New England’s starting left tackle has been nothing but a disappointment thus far as he’s struggled in the team’s first two preseason games. It’s hard to pinpoint Solder’s major weaknesses, as he’s simply been dominated by each and every pass-rusher lined up across of him. He’s been over-powered, he’s been out-maneuvered and has been beaten with speed. If Solder wants to be a solid replacement to the retired Matt Light, then he’s going to have to start living up this potential. 2. Tom Brady’s Performance: We really haven’t seen much of Tom Brady, just for a few series in Week 1 against the New Orleans Saints. This is always something to watch for in the “dress rehearsal”: How the team’s starting quarterback performs. 3. Brian Hoyer and Ryan Mallett: Still into the third game of the preseason, the battle for Tom Brady’s backup is still up in the air between Brian Hoyer and Ryan Mallett. As of right now, I would have to give the slight edge to Mallett considering how well he played against the Philadelphia Eagles’ starting defense on Monday night and how Hoyer really struggled to gain and rhythm against Philly’s backups. Depending on how long Brady is on the field, Hoyer certainly wont have much time to make up ground behind the second-year quarterback. 4. Wes Welker’s Status: As of right now, it appears that Wes Welker will not be playing in Friday night’s game against Tampa Bay. Welker did not dress for Thursday’s practice and left one practice early late last week. With Welker likely being out, only we can assume that Julian Edelman will fill his role while Jeremy Ebert being relieving him later in the game. 5. How the Offensive Line Plays with Logan Mankins Returning: New England’s struggling offensive line will gain some huge help Friday night with left guard Logan Mankins likely returning to the line-up. It will also be noted how well Mankins plays as he’s coming off of ACL surgery that was conducted in February. The team’s offensive line will likely have another boost of help with right tackle Sebastian Vollmer likely suiting up and playing. If Mankins and Vollmer do play, then New England will be rolling out their likely starting offensive line for Week 1 of this season.